Hot on the heels of its Indonesian office opening last week, Twitter has officially opened its Hong Kong office today to service the online and mobile advertising markets across Greater China. With many Chinese brand advertisers and app developers selling to the worldwide market, Twitter provides an attractive opportunity to reach over 288 million monthly active users, 80% of which are on mobile, that send over 500 million Tweets per day. In addition, millions of people across Hong Kong and Taiwan use Twitter, and local advertisers can reach them directly, too. 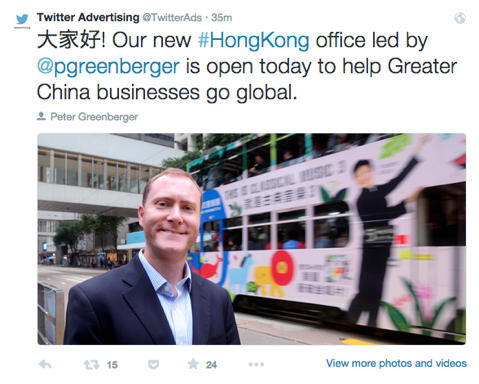 The HK office will be led by Peter Greenberger (@pgreenberger), Twitter’s Sales Director of Emerging Markets. Twitter Hong Kong is actively hiring and open roles are available at www.twitter.com/jobs. Startup Launchpad is Back. Bigger. Better.